FORT BRAGG, N.C. (USASOC News Service, Oct. 23, 2015) – Master Sgt. 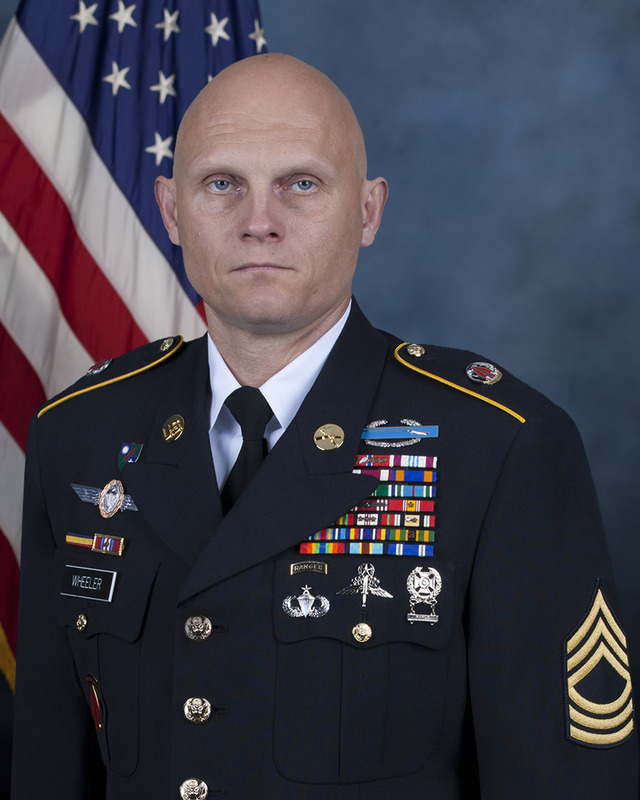 Joshua L. Wheeler, 39, assigned to Headquarters, U.S. Army Special Operations Command, Fort Bragg, North Carolina, was killed in action Oct. 22, while deployed in support of Operation Inherent Resolve. In February 1997, he transitioned to Company B, 2nd Battalion, 75th Ranger Regiment, Fort Lewis, Washington, where he served for over seven years as an infantryman, rifle team leader, squad leader, weapons squad leader, and anti-tank section leader, deploying five times in support of combat operations in Afghanistan and Iraq. Wheeler was assigned to U.S. Army Special Operations Command in 2004, and deployed 12 times in support of combat operations in Iraq and Afghanistan. Wheeler’s military education includes the Basic Airborne Course, Ranger School, Warrior Leader Course, Static Line Jumpmaster, Military Mountaineering Course, Basic and Advanced Demolition Courses, Advanced Urban Combat Training, Advanced Marksmanship Techniques, Close Range Tactical M4 Training, Infantry Advanced Leader’s Course, the Survival, Evasion, Resistance and Escape (Level C) Course, Infantry Senior Leader’s, Military Free Fall Course, and the Military Free Fall Jumpmaster Course. Wheeler’s awards and decorations include four Bronze Star Medals with Valor Device, seven Bronze Star Medals, the Defense Meritorious Service Medal, the Meritorious Service Medal, the Air Medal, the Joint Service Commendation Medal with Valor Device, the Joint Service Commendation Medal, seven Army Commendation Medals, the Joint Service Achievement Medal, eight Army Achievement Medals, the Good Conduct Medal (6th Award), the National Defense Service Medal with Bronze Service Star, the Afghanistan Campaign Medal with 3 Bronze Service Stars, the Iraq Campaign Medal with 6 Bronze Service Stars, the Global War on Terrorism Expeditionary Medal, the Global War on Terrorism Service Medal, the Noncommissioned Officer Professional Development Ribbon (3rd Award), the Army Service Ribbon, the Presidential Unit Citation, the Valorous Unit Award (2nd Award), the Ranger Tab, the Combat Infantryman Badge, the Expert Infantryman Badge, the Master Parachutist Badge, and three Overseas Service Bars. Wheeler was posthumously awarded the Purple Heart. He is survived by his wife, four sons, and his grandmother and grandfather.